JUUL is a new form of electronic cigarettes. The maker of the popular e-cigarette Juul has been sued in a Philadelphia federal court by users who allege the company has violated consumer protections laws, engaged in deceptive marketing and failed to include warnings about the level of nicotine the product delivers. The class action complaint was filed Aug. 31 on behalf of four plaintiffs and others in Pennsylvania and New Jersey. The plaintiffs are seeking monetary damages and asks that Juul change its marketing and product, according to court papers. "We do anticipate amending the complaint to add many more state classes," said Russell Paul, an attorney representing the plaintiffs. "People are reaching out to us from all over." A similar lawsuit was filed in New York in July, the Washington Post reported. The Philadelphia lawsuit alleges the company markets on social media sites frequented by children including Twitter, Instagram and Facebook. It claims the company is aware youths "discuss and promote" the product through the use of hashtags and comments to ad campaigns on social media. "JUUL Labs does not believe the cases have merit and will be defending them vigorously," stated Victoria Davis, a spokesperson for the company. The San Francisco-based firm is a spinoff of Pax Labs, which is also named in the lawsuit. The company was founded in 2007 by two Stanford University design students and has seen the use of its trendy product skyrocket. Juul has captured about 68 percent of the U.S. e-cigarette market and is valued at $15 billion, Bloomberg reported in June. "We are not familiar with the lawsuit, but we are very concerned that Juul and other e-cigarette products are attracting young people into nicotine addiction," Thomas Farley, Philadelphia's health commissioner, said Friday. The digital-like design and tiny pods filled with flavored nicotine juice have caught on fast with the under-18 set. The device resembles a computer thumb drive, making it easily concealable,. Some school districts have even banned the use of real USB drives on campus. One Juul pod delivers about 200 puffs or as much nicotine as a pack of cigarettes, the lawsuit states. One of the plaintiffs, David Lechtzin, was 17-year-old high school student in Huntingdon Valley, when he was introduced to the e-cigarettes at a party. Before he was able to buy them on his own, he got the pods from his older friends. He saw Instagram posts that portrayed Juul as "cool," according to the lawsuit. Lechtzin claimed that when he first began using Juuls he was not aware now much nicotine they contained. At that time, the device and packaging did not contain any warnings about nicotine. He now uses at least four pods a week and considers himself an addict. Lechtzin would not have tried Juul had he known they contained nicotine, according to the lawsuit. 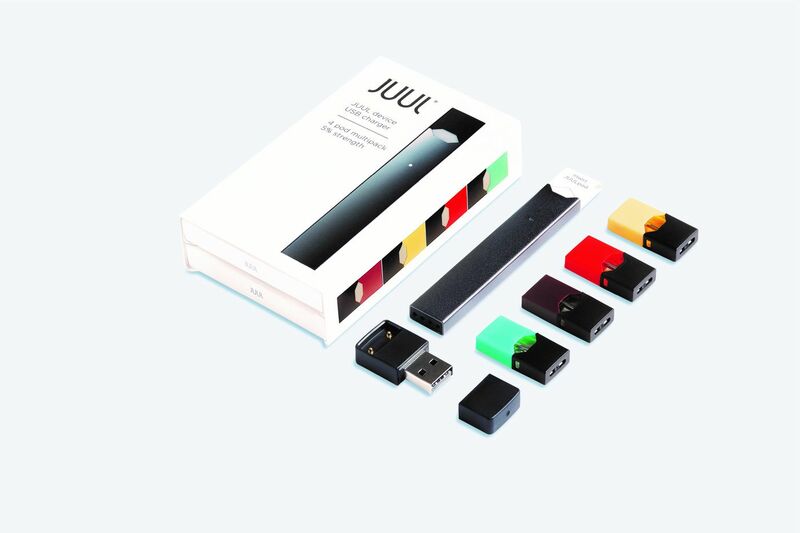 Juul recently has been advertising in newspapers, including The Inquirer, stating that its product is intended for adults. Another plaintiff, David Masessa of Chatham, N.J., began using Juul in 2015 in an effort to stop smoking cigarettes. He had been smoking up to a pack a day and saw claims in online publications and on the Juul website that using the pods would help wean him off cigarettes and other nicotine products. Masessa now believes he is addicted to using Juuls and uses one pod every two to four days. The suit states that Juuls deliver "dangerous toxins and carcinogens to its users," an assertion the company has disputed. Research on the products — both on its possible dangers and on whether it helps people quit smoking cigarettes — is ongoing. Exposure to nicotine increased the risk of coronary vascular disease and peripheral artery disease. In addition, the act of inhaling the vapors, or vaping, introduces foreign substances into the lungs and with prolonged use may result in chronic obstructive pulmonary disease, the suit claims. "There is a lot more science coming out as the product becomes more widely used," said Freiwald. "The claim that this is a safer alternative, is false." A study in the journal Tobacco Control, released Friday, looked at the nicotine exposure of 506 adolescent e-cigarette users, specifically those using Juuls and other vape pod systems. The researchers found levels of a byproduct of nicotine metabolism in the study group's urine that were higher than what has been reported among adolescent cigarette smokers. The finding "raises significant concerns about the risk of nicotine addiction and long term product use," said Rachel Boykan, a pediatrician at Stony Brook Children's Hospital in New York and the study's principal investigator.